Soaring Eagles is sponsored by: Southern California American Indian Resource Center, Inc. SCAIR. Coordinated by Vickie Gambala of the San Diego Unified School District, Title VII Indian Education Program and assisted by the Indian Human Resource Center IHRC. 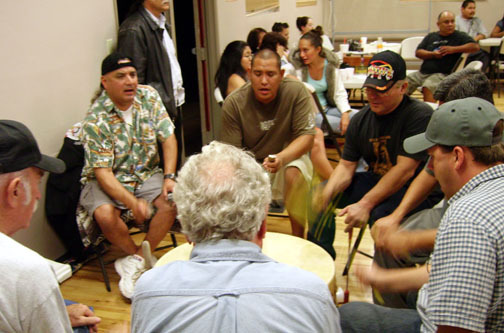 Also, Viejas Pow wow committee invited IHRC and co-organized this Veterans pow wow on the Viejas Band of Kumeyaay land. 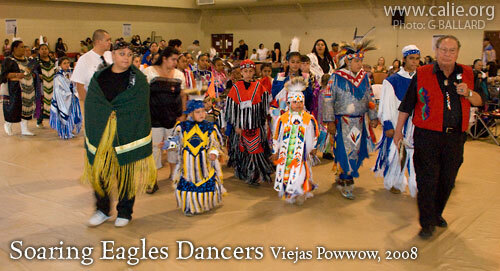 The Soaring Eagle students are brought into the pow wow circle at the Veterans pow wow at the Viejas Band of Kumeyaay Indians Recreation Center on November 8 & 9, 2008. SCAIR Senior Advisor, Randy Edmonds spoke for the Indian children, parents and principal instructors. 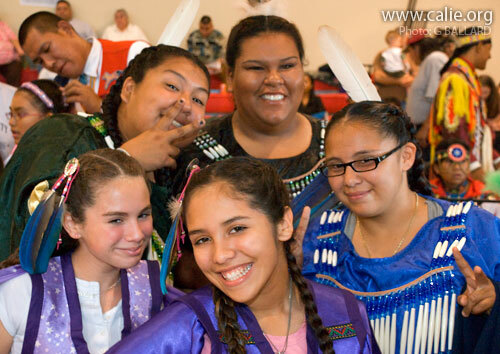 The Soaring Eagles powwow dance classes brought together American Indian dancers from different tribes to share their Intertribal powwow dances. 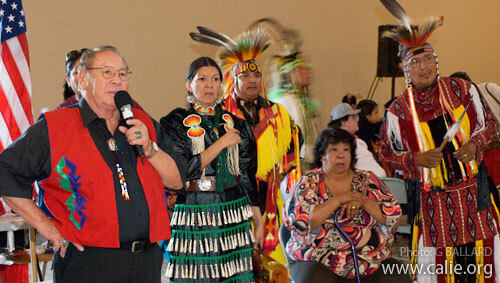 This Veterans Pow wow has been one of the major focal points of these efforts. Chuck Cadotte, Instructor, Connie Greybull, Carol Wesley and community volunteers were the Sewing Instructors, Michael Cadotte, Fancy Dancer Instructor, Eileen George, Traditional Dancer Instructor, Jeanette Keeme, Fancy Dance Instructor and other volunteers who represent a variety of backgrounds, interest and skill levels of powwow participants. Additionally, Randy spoke to the assembled group about the circle of life they were entering. The pow wow arena is in one regard social, some say that many pow wows are too commercial but the basic context is Tribal. The richness of the Indian culture endures in the modern Inter-tribal pow wow. Randy began with the north cardinal direction, Grandmother country. Then he led the group into the east, from where the Sun rises and spoke to this direction and its significance. Continuing, in a sun wise direction they faced south. Next they moved to the West and he spoke to this land, right here, California. He reminded us that we must always be respectful of the hospitality offered by the local Tribal peoples. As he completed the circle he called for an honoring song for all to recognize this entry of the Soaring Eagle students into the pow wow circle ceremony. 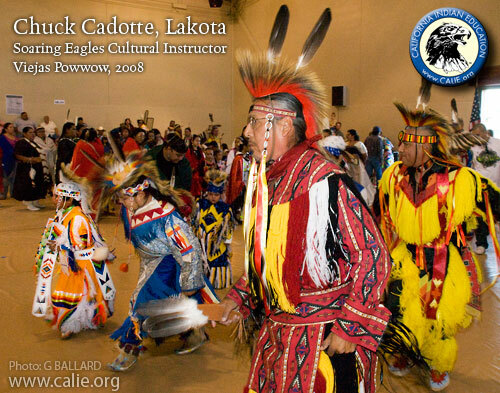 He also calls upon: head staff, family, friends, instructors and all who wish to join in the honoring dance. All life is a ceremony. Our fondest wish is to live our lives as a song. All creation is a dance of life. To be there is good, hopeful and it is humble to be a small part of this day. Naturally all honors, ceremony and recognition must be 'covered' or completed with a give away. A give away shares the respect, recognition and honor that is brought to ones family. Indian people give from the heart. Contest dancing by categories and more specials by head staff follow until the dinner hour. Great songs are sung over these two days by the two host drums: Green River, Rainy Mountain and the added visiting singers of other drums. The Soaring Eagle classes will continue to meet November 19, 2008 at the Normal Heights Community Center 4649 Hawley Blvd. San Diego CA 92114 after a week break and some future planning of the pow wow winter program. All instruction, fun, songs are free to the public but it is a community feast POT LUCK so bring something good for others to share on November 19, 2008. Thank you, Aho, Mehan.